Electric guitars, introduced in the 1930s, rely on an amplifier that can electronically manipulate tone. Early amplified guitars employed a hollow body, but a solid body was found more suitable. Electric guitars have had a continuing profound influence on popular culture. While guitar construction has many variations, in terms of the materials used for the body, the shape of the body, and the configuration of the neck, bridge, and pickups, there are features which are found in most guitars. 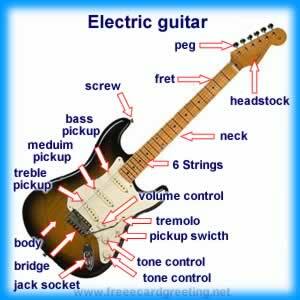 The photo below shows the different parts of an electric guitar.